ca 330 - 310 B.C. Medea slays her son upon an altar to avenge the betrayal of her husband Jason. 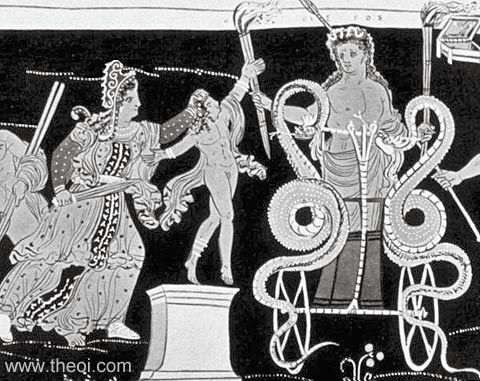 The Eleusinian demigod Triptolemus arrives on the scene driving a flying, serpent-drawn chariot to assist her escape. Medea wears a Phrygian cap and brandishes a sword. The god carries a pair of flaming torches.